Wednesdays at 9:30 a.m. & Fridays at 10 a.m.
Each week we run hundreds of vehicles through three climate controlled auction lanes. We offer the most new car dealer trades in the Tri-State. 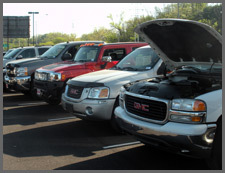 Our fast-paced environment allows you to get in, get your vehicles, and get back to your lot. After you have completed your purchase, we offer transportation services. The afternoon before our dealer auction you will find an updated run list of the cars that will be available. 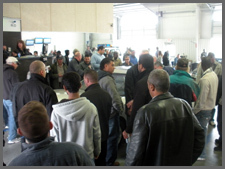 Registered dealers are welcome to come on site and inspect the vehicles anytime before the sale. In order to participate in the dealer auction, you must have a valid Motor Vehicle Dealer License and be registered in our system. To begin registration, please visit our dealer registration page or call our office at (513) 679-7910. We would love to see you at our next dealer auction. 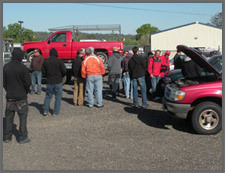 Registered Dealers can bid on salvage and tow vehicles every Wednesday morning at our Tow Lane Auction. You will find a list of tow vehicles at the bottom of our dealer run list; T=Tow.